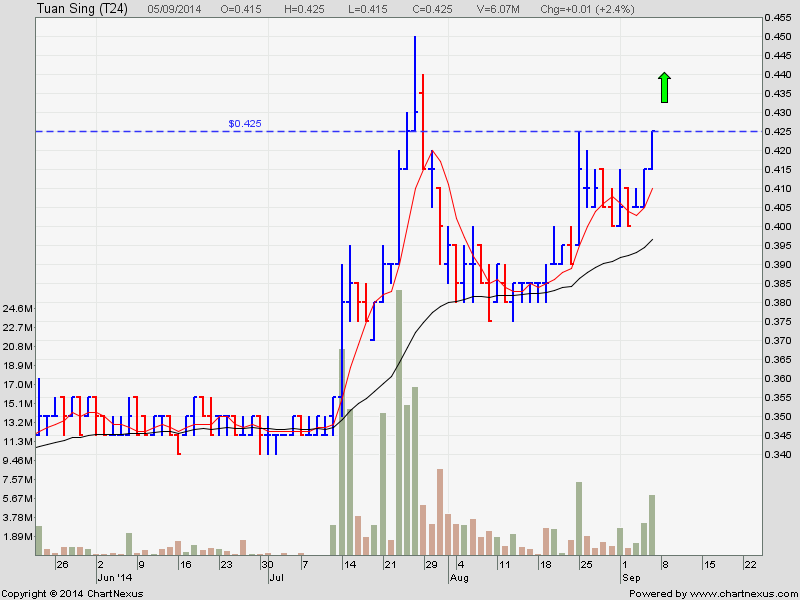 Tuan Sing is poised for a breakout with buyers coming back for this stock recently. 1) I am pretty busy for the last few days meeting clients to sign them up for Unit Trust investing as most of them want to invest in European fund to ride the BULL run in European equity after ECB President Mario Draghi announced QE on thursday. Since early August after the European correction, I had switched all my client Cash and CPF fund into European equity fund and today (about 1 month later), their fund have made a return of about 5%. I am expecting more and will post the return here after I exited the investment. This year, I am expecting to hit 40% return for my Unit Trust Investing using my wonderful Unit Trust Investing system. Many people complained about the high cost of living and the high CPF minimum sum scheme in Singapore yet they don’t want to invest and prefer to leave their money in the bank and CPF earning 0.5%/pa and 2.5%/pa respectively, but lose 3% – 10%/pa to INFLATION. Isn’t this madness? Almost all of my client, who are in their late 50s and early 60s, their CPFOA fund have far exceed the CPF minimum sum scheme because they have invested them for the last 8 – 10 years. They had caught the china run in 2007, the market rebound in 2009 and the Japan run last year. For those who want to ride the BULL run in European market via Unit Trust and those who want me to manage their Unit Trust Investment using my wonderful Unit Trust Investing System for free, you can contact me here. I am using the Great Eastern Unit Trust platform called Prestige Portfolio, which is the cheapest online platform in Singapore, to manage my client Unit Trust Investment.